Wow! What an eclectic mix of people and shops in Venice Beach California! This is the place you want to be for some major people watching! 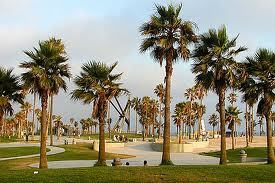 I love it here because its so different than most beach towns in southern California. It definitely has it's own vibe. The boardwalk is what makes Venice so unique. Even on weekdays, especially in the summer, there are so many people that come to visit and see street entertainers like jesters, jugglers, mimes, musicians, break dancers and even broken glass walkers! You'll see lots of people just walking around, riding bikes, skate-boarding, roller-blading, dancing and just hanging out. The World Famous Venice Beach Boardwalk is a fun place you just don't want to miss if you're visiting the Los Angeles area. If you happen to be in the area, you should just go check it out, especially in the summer months. On the west side of the boardwalk are hundreds of vendors and performers. You can get a temporary tattoo, have your name written on a grain of rice, have your fortune read or buy one of many very unique souvenirs. Rocks, sculptures, paintings, arts and crafts and various odds and ends can all be found here. 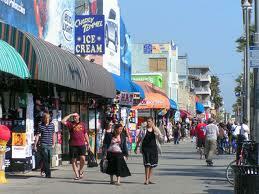 The east side of the boardwalk is where you'll find the store fronts. Skate and Surf Shops, Tattoo and Piercing Stores, even Medical Marijuana Dispensaries. Plus there is a decent selection of bars and eateries. All this is packed into one and a half miles of boardwalk! Its a crazy fun place, not one that I'd want to go to every weekend, but its one to see for sure. Trippin Thru California Insider Tip! It would be a good idea to bring one dollar bills with you, if you appreciate an artist's work or watch an entire performer's show, please leave a tip! They do this for you! Well, and the money of course! 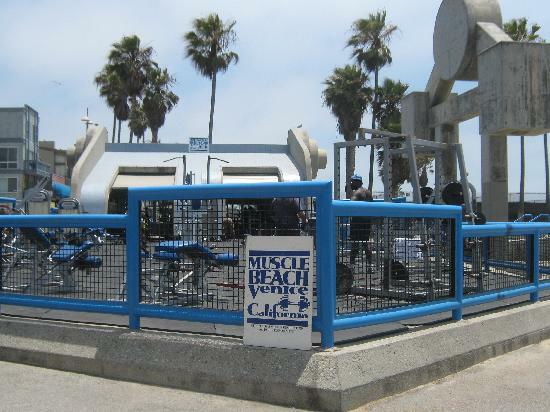 Muscle Beach is a special area where body building fanatics pump iron in a public show of strength. Hot bodies from people of all ages work out under the sun here. Competitions are also popular at Muscle Beach. Lots of people just stand around watching these body builders pump iron, and I think the body builders enjoy an audience.